Ocean 'Global Warming' is not actually 'global' at all | Watts Up With That? UPDATE: I forgot to note that the data in Figure 1 have been zeroed at the year 2003. That was done to simplify the illustration. The National Oceanographic Data Center (NODC) recently updated their ocean heat content and vertically averaged temperature data for the oceans to depths of 2000 meters. See the NODC data webpage here. Alarmists are having a grand time trying to scare their readers with their chicken-little end-is-near proclamations. Example: see the post titled “The oceans are warming so fast, they keep breaking scientists’ charts” at SkepticalScience here and The Guardian here. Also see Joe Romm’s post ‘Hottest Year’ Story Obscures Bigger News: Ocean Warming Now Off The Charts at ClimateProgress. Of course, the alarmists present the ocean heat content data, not the vertically averaged temperature data. Why? The oceans have an extremely large heat capacity, so a very slight increase in the temperature of the oceans to depths of 2000 meters represents a very large uptake of heat when placed in terms of 10^22 Joules…the units used by the NODC. So to counter the alarmists, we present the NODC data in terms of deg C (data here), because people are more familiar with temperature. We also break the data down into basins and subsets to show that the warming rates are not uniform, which is tough to explain with greenhouse gas-driven human-induced global warming. 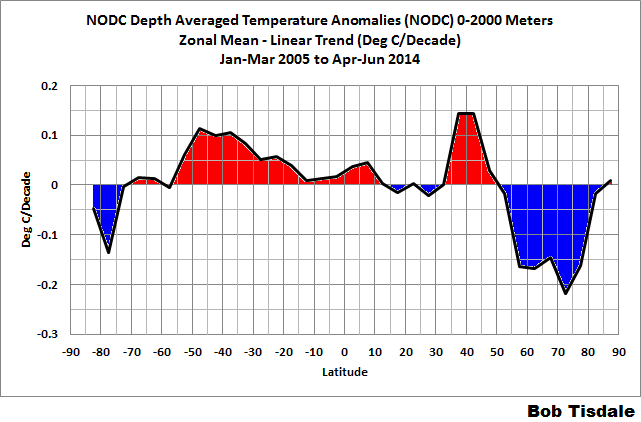 So here’s a general introductory discussion of that NODC temperature data to depths of 2000 meters. Reasonably complete temperature samples of all the ice-free oceans to the depths of 2000 meters (about 6600 feet or about 1.25 miles) have only been available for the past decade or so. Those new sensors were deployed as part of the ARGO program in the early 2000s and did not have complete coverage of the oceans until about 2003. The U.S. National Oceanographic Data Center (NODC) uses those temperature samples for a number of datasets, including their vertically averaged temperature data for the depths of 0 to 2000 meters. Before the early 2000s, even the IPCC calls into question the usefulness of the sparse temperature measurements of the deep ocean. They note that before ARGO the data cannot be used for attribution studies. In other words, because the data are so sparse, they cannot be used to determine the cause of the warming. Also see the post here. It shows how sparse the pre-ARGO data are. 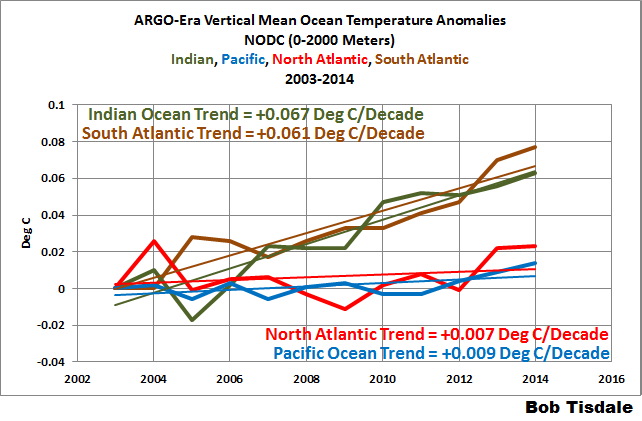 As shown in Figure 1, the ARGO-era temperature data for those depths show the South Atlantic and Indian Oceans have warmed, while the North Atlantic and the largest ocean on our planet, the Pacific, show very little warming over the past 12 years. The pie chart in Figure 2 helps to put that in perspective. 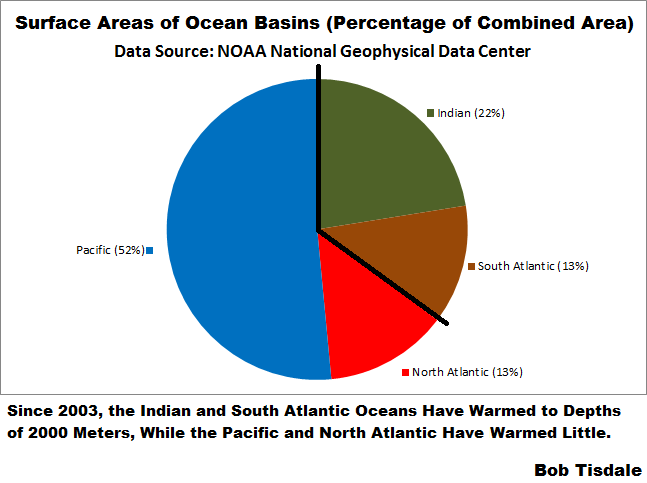 It illustrates the surface areas of the Indian, South Atlantic, North Atlantic and Pacific as percentages of their total surface area. (Source of the surface areas is here.) The North Atlantic and Pacific Oceans cover almost two-thirds of those oceans and they have warmed very little in 12 years to depths of about 2 kilometers (1.25 miles). Now look again at the graph in Figure 1, this time concentrating on the scale of the vertical axis (y-axis) and on the listed warming rates. For the South Atlantic and Indian Oceans, the warming rates measured in one-hundredths of a deg C/decade, while for the North Atlantic and Pacific, the trends are in one-thousandths of a deg C/decade. Something else to consider: the raw ARGO-based temperature data don’t show that much warming. The data have to be adjusted to show those warming rates. The other problem: manmade greenhouse gases are said to be well-mixed, meaning they’re spread pretty evenly above the Earth’s surface. It’s difficult at best, therefore, to imagine how manmade greenhouse gases could be warming one-third of the oceans to depths of more than a mile but not the other two-thirds. The other problem: I had explained the difference in the warming rates between the Indian and Pacific Oceans a number of years ago. See the discussion of Figures 19 and 20 and Animations 1 and 2 in the post Is Ocean Heat Content Data All It’s Stacked Up To Be? But because manmade greenhouse gases are said to be evenly mixed, the multi-model mean of the climate models used by the IPCC (for attribution studies and projections of future climate) show a relatively uniform warming of the oceans. Yet in the real world that is not the case. See the illustration here from Durach et al. (2014) Quantifying underestimates of long-term upper-ocean warming. The multi-model mean basically represent how the oceans should have warmed if they were warmed by manmade greenhouse gases. It’s difficult at best, therefore, to imagine how climate modelers will attempt to explain how manmade greenhouse gases could be warming one-third of the oceans to depths of more than a mile but not the other two-thirds when their models show a more uniform warming. For more info on the problems with ocean heat content data see the post Is Ocean Heat Content Data All It’s Stacked Up to Be? January 22, 2015 in Ocean Heat Content, Ocean Temperatures. Measured in thousandths of °C per decade. Is not it marvelous that these wonderful Argo devices can measure to such great accuracy? You mean precision. I’m not surprised people on this website are scientifically illiterate! Don’t get all insufferable. Are you perfect? No? A word does not make someone “scientifically illiterate”. That designation is reserved for believers in catastrophic AGW. Sorry Tom, mpainter is correct in his usage. From Webster’s and Dictionary dot com. The extent to which a given set of measurements of the same sample agree with their mean. The ARGO floats have, at best, an accuracy tolerance of +/- 0.01°C when brand new. They drift (in more than one sense) after that. If a whole bunch of them all happened to be +0.1°C from NIST that group of floats would be precise, but still not accurate. If a bunch of them were +0.01°C and a bunch were -0.01°C they would be accurate, but not precise. And how does that hot atmospheric air warm the oceans in the first place? 105 F air in Phoenix doesn’t warm that swimming pool especially enough to counter the massive latent heat of evaporation. It’s the water vapor cycle, clouds, precipitation and ocean floor geothermal heat flux that heat/cool the oceans and power the climate. CO2/GHGs are nothing but bee farts in a hurricane. Hey, I got hit with a bee fart once. It ain’t pretty. Anyway, it’s obvious that they use “ocean warming” because they know there’s no way for the average joe to check them and prove them wrong. They can say anything they want, and they know that no one has an “ocean thermometer”. Next, it will be a change in tree rings that only the “experts” know how to interpret. They’ll point to the grain in our dining room tables as “proof” that the planet is warming. The reason is that the heat content change is real. The vertically averaged temperature change would be meaningful if the heat were uniformly mixed. But it isn’t. Nothing like it. It would take centuries to reach that state. If it made sense to take such an average, why stop at 2000m? The quantity of recorded observations decreases as a function of depth. Well of it does not make sense to stop at 2000m for average temp, it also does not make sense to present ocean heat content data based on the same data. If suddenly it is about heat content, why average atmospheric temperature anomalies instead of atmospheric heat content. If apparently the “hot” issue now is heat transfer, maybe it is time to dump the whole global temperature approach and build new models that model the heat transfer properties between land, sea, sky and space from the last ice age to now. You can’t have it both ways, switching approaches as convenient. This moving and switching of the goal posts is exhausting, I have no idea how Bob is able to keep up with it. OHC accumulates mainly in the top few 100 m. So a scan in that range captures most of it. And it can be chacked against sea level rise. It’s real. Vertically averaged temperature is a theoretical notion, and isn’t anything real. But 2000m is an arbitrary stopping point. Thanks, Nick. I was hoping someone would give me an excuse to post the NODC’s depth-averaged temperature anomalies for the other depths during the ARGO era. For the depths of 0-100 meters, only the Indian Ocean shows warming. And for the depths of 0-700 meters, the South Atlantic and Indian Oceans show warming, the Pacific is basically flat, and the North Atlantic shows cooling. This has got to be the most ironic comment I have heard in my entire experience with climate warming over the last 15+ years. Neither the Ocean Heat Content nor GISS LOTI are in yottajoules. Are you sure that heat content in joules is used because they don’t want people to notice that the change is less than 0.09°C?. Surely that’s an argument for using the change in average heat content per unit volume? Yottajoule/cm3 maybe? If that’s the case, how are we to imagine the last thirty years of warm temps are heating the deep ocean? At one time the website said that the five “research” measurements were buckets on a rope, thrown off a commercial ship corralled into helping, and dragged along before being hauled up and measured. That was it. Forty years. Made me wonder how Levitus, et al, got their measurements. The same? Read this 2000 article by the late Oceanographer, Dr Robert Stevenson, for details of where Levitus et al got their data. Still they are looking for missing heat that was never missing in the first place. It obviously makes sense to take such an average–the NODC presents it. There’s no reliable data below 2000 meters. You know that, Nick. Thus the need for deep ARGO. In fact the NODC presents the actual average (to a range of depths); what you have done is to take the total heat content and get the theoretical average if it had been mixed to 2000m. Now it’s true the answer for 2000m should be much the same, but yours is more arbitrary, since the notion of total heat isn’t tied to 2000m. We’re not discussing and the NODC is not presenting “the notion of total heat”, so you comment seems to contradict itself. My assumption is that your use of the term “notion of total heat” refers to total heat content from ocean surface to ocean floor. 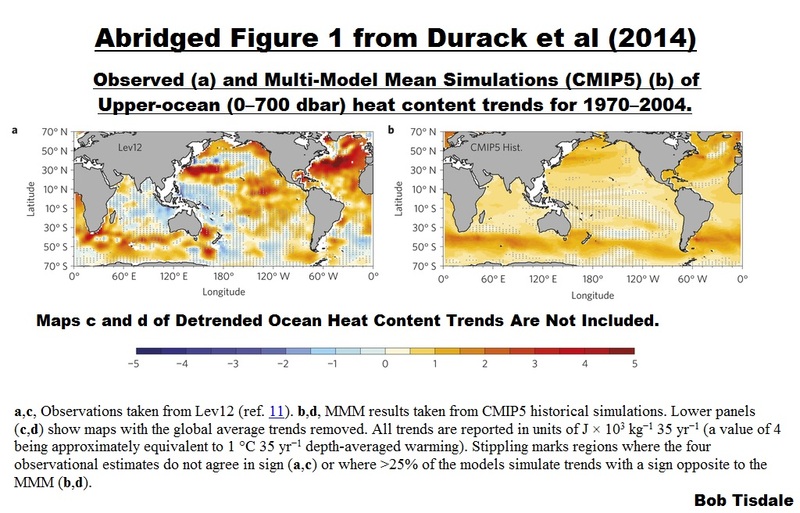 The NODC presents ocean heat content data (and depth-averaged temperature anomaly data) for specific depth ranges that do not reach the ocean floor, just as you noted. Your argument is flawed, Nick. The change in depth-averaged temperature anomalies are real also. In fact, the ocean heat content data are derived from the depth-averaged temperature data. Meridional overturning circulation is the primary mechanism through which waters nearer the surface are transported to depth. Once the warmer-than-normal waters are transported below the mixed level at high latitudes, through what mechanism are they going to reappear intact at the surface? And how long would it take for it to run through that cycle? There should be some serious engineering design trade-offs to go below 2000m. – Reliability decreases as pressure increases, seal failures, etc. – More work for the hydraulic piston motor, shorter battery life, fewer cycles. – More data, longer to transmit? They must have done the engineering trade and concludedL Everything interesting happening in the ocean is happening in the top 2000m, the rest below isn’t worth the costs. “The reason is that the heat content change is real” Nick are you suggesting that temperature change isn’t real? OK, I’m actually going to defend Nick on this one. We have complained time and time again about how meaningless planet-average surface temperature is. He’s right on one thing, the amount of heat entering the ocean is a real, calculated number. The average temperature change is not. However, Nick, the reason why to not use it is better than the reason to use it. The use of insane numbers of joules hides the magnitude by changing to an unfamiliar reference frame. A simple statement of the total amount changed, 0.01 C over a decade, is understandable and quickly graspable. These are extremely minute changes in temperature and the use of energy transfer is simply to hide this fact. Why stop at 2000m? Because Thomas Stocker himself said we do not have the technology to measure the deep oceans below 2000m. So what I would like to know, in view of this revelation that the world’s (Southern) oceans are NOT well mixed. How do the glaciologists know which Antarctic plateau snow (in an ice core) came from which one of those oceans. Seems like Vostok snow deposition rates are so low, and that place is so centralized (they don’t refer to it as the pole of inaccessibility for no reason) that the snow in any snow precipitate in Antarctic highlands could have come from any southern ocean on earth and they all have different Temperature histories. So just how can they isotopically peg the temperature of the ice core water, if they don’t know exactly which ocean which layer comes from ?? Adjusted data aren’t correct data. Well that’s one thing only gives same results as the correcting man/woman behind it intend. In other words bad input -> Bad output. The big trouble for the “Warmist”-belivers is that every adjustment show lack of skill and/or expericence in using what’s normally called Analyse-2. In other words lack of mathematic knowledge using more than one or a few variables in an analyse. It’s one thing to be stupid. That’s ok everyone can’t possible have had time to study nor use higher math…. but to show the stupidness…. that’s an other thing. When will they ever learn? and Where have all the money gone? Yes we know that we humans don’t have capacity to know half as much as some of us tries to make believe…. The atmosphere does not warm water, as you point out, nick. There is a reason why, having to due with the radiative physics of water, specifically its absorbency spectrum with respect to IR. Water is _opaque_ to IR. IR that is incident on the surface of water does not penetrate but is converted to latent heat within seconds. This is confirmed by simple experiment. IR cannot heat water. This means that no amount of atmospheric CO2 can contribute to SST, which is determined solely by insolation. This is the skeleton in the climate science closet. All the hoopla about ocean heat content is utterly bogus. Have you ever used a microwave to reheat your coffee ? Yes. What does that have to do with my comment, pray tell? Who confuses microwave with IR? The internet has got you now. No escape. Please pay attention. Microwave radiation it NOT IR radiation! That was my response to roach. Don’t be so sensitive. It should have been clear from my comment who I was referring to. As mpainter correctly observes, LWIR does not penetrate water to any significant degree. Given the omni directional nature of DWLWIR about 60 to 70% of all incoming DWLWIR is fully absored in just 3 microns. That is one heck of a lot of energy (if DWLWIR possesses sensible energy capable of performing sensible work in the environ in which it finds itself) and would simply result in energizing the water molecules in the top 2 or 3 microns powering evaporation. Virtually no DWLWIR makes its way past 15 microns, so DWLWIR is incapable of effectively heating the oceans. This is especially so since the energy flow is upwards in the top millimetres of sea water; the very surface is cooler (because evaporation takes place at or extremely close to the surface) than the immediate layer below such that heat/energy absorbed in the top microns cannot make its way downwards by conduction against the direction of the energy flow and temperature profile of the top millimetres of the ocean. Ocean over turning is a slow mechanical process, so too is the effect of wind and wave action; which action in any event is almost non existent in conditions of BF2 to 3 and below. The average wind speed over the oceans is just over BF4, so vast stretches of the ocean for much of the time must be experiencing wind conditions of below BF2 to 3, so in these conditions there can be little physical mixing of the top layers of the oceans..
Micrwaves are different, because of their different wavelength. The absorption characteristics of microwaves in water is very different to that of LWIR. Further, a lot of microwave cooking is done by conduction from layer to layer. Bob’s post proves the point. All the ocean basins are showing warming (if one believes that the data can be measured to hundreds or thousands of a degree) at different rates. 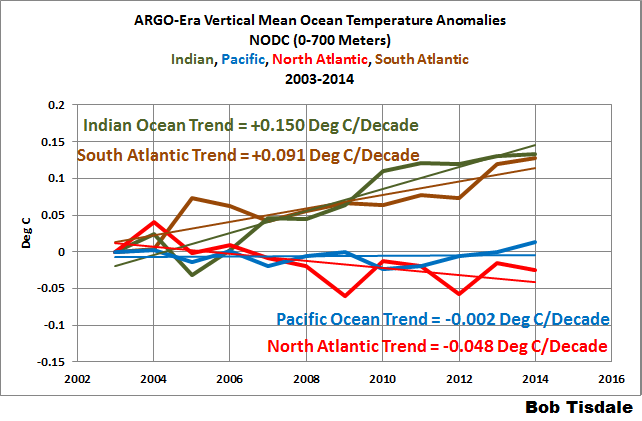 In fact some ocean basins are showing no warming, possibly even cooling. This would not be the case if rising CO2 has led to rising DWLWIR and that increased level of DWLWIR was capable of warming the oceans. Begging your pardon, I mistook your comment as meant for me. Also, under the AGW meme, only the DWIR from CO2 added by humankind would have any effect on SST. But the IR emittance of CO2 is absorbed within 3 microns. And those three microns are evaporated in less than a minute in lower latitudes. Increased SST is well explained by the increase in insolation via the reduced cloud cover as shown by cloud data, beginning in the mid-eighties. “Adjusted” data is, like, you know, “adjusted” footballs. If CO2 absorbs IR subtracting the work function means it can only re-emit in the microwave range, the phenomena we use to heat water in the eponymous appliance, but that’s sensible heat not latent. Water is warmed to air masses due to heat exchange, first law of thermodynamics. Well that is a good thing since the Second Law of Thermodynamics suggests that when the oceans cease to exchange energy, pretty much means they are dead. The issue remains that two thirds of the oceans have no significant difference in heat. For the third remaining oceans while the change in temperature is larger it is also insignificant and well within the margin of error. Finally no one knows why the oceans are perhaps, may be getting a tiny, tiny bit warmer. The atmosphere heating them up is speculation. The idea that man-made emissions of CO2 have measurably warmed the oceans is supported by nothing other than the imaginations of people desperately wishing for the AGW hypothesis to be true. agreed. Belief has taken over from critical thought and scientific analysis in the anthropogenic CO2-GW scientists. OCO-2 data should dissuade them of that misguided belief once they see that man’s CO2 release is trivial in the background of natural sources. Roy makes no definitive statement in this regard. He in fact neglects to address the specific radiative physics of the matter: the absorbency of water with respect to IR. Water is opaque to IR. Incident IR is converted to latent heat within seconds. Because of this, IR has no effect on SST. The assertion that atm. CO2 contributes to ocean heat content is fiction. Sensible heat, not latent heat. Ever stood in front of an electric radiator? You are just as opaque to IR as water. But you get warm. No, Nick, not the same thing. Different elements, different molecules, different absorbency properties with respect to IR and different wavelengths. For example, heater elements emit visible near infra red, not your greenhouse flux. See the radiative absorbency of water, Nick. Look it up. Go experiment with a heat gun and a bucket of water. But I don’t ” doubt IR can’t heat water”. I am certain that it can’t. Amusing link you’ve got. Bound to dupe SKS types. Got anything without lasers? No? Check out the tables. Water is opaque to IR. Delighted to see who disagrees. From the document: “Clear water has a low spectral reflectance (< 10%) in the visible region. At wavelengths longer than 0.75 µm, water absorbs almost all the incoming energy." Since .75 is at the edge of NIR, that means that water absorbs nearly all IR. There are many other examples, just google the words water reflectance spectrum and look at images. Chris, see my comment at 9:07 pm below. Try an iron bar. Is that opaque to IR? Surely no deep penetration. This is a bad example. For practical purposes the effective heating from a radiator is by convection. Indeed, most heating radiators describe themselves as convection heaters, and have fins on the reverse side to maximise air flow. The rising warm air leads to a circulating effect heating the room. If you place your hand parallel to the side of the panel radiator just a few centimetres from the radiator (running at a temperature of about 70 to 80degC), you struggle to feel any warmth. On the otherhand, if you place your hand above the radiator you can feel warmth some 1 to 2 metres above. the radiator. That is because the heat is carried up by convection, and therefore very little heat penetrates in a sidewards direction (even though that may be the direction of radiation). before it propogates sideways to any degree, the heat is carried upwards and away by convection. The same is so with a BBQ. Whilst the initialisation of the energy is radiation, the food is cooked by convection. You can cook food 6 to 18 inches above the BBQ (because the heat is carried up by convection), but not 6 to 18 inches from the isde of the BBQ (because the heat does not effectively penetrate in a sideways direction because it is carried upwards and away by convection). To the extent that you feel warm by the side of a radiator, it is predominantly due to conduction with warmer air (which air has been heated by the radiator) being in direct contact with your body. But, and this is the material point, in the oceans there is no such transfer by conduction, because the energy flow is upwards at the very top of the ocean; the surface is cooler than the millimetres below and energy cannot be conducted to depth against the direction of the energy flow. The oceans are very diffferent and unfortunately, climate scientists have yet to grasp this..
Painter, How about you go down to your friend’s house (the one who is obviously providing you with smoking material since you are obviously educated yet proclaiming obviously wrong information) and borrow a heat lamp. These are infrared lights that provide heat. Now, put a cup of water under the light for a while. After a while, It will get hot, or at least warm, throughout the cup. You can make tea this way if you want. I could explain how precisely you are wrong, but does the precise mechanism matter? Not really. Infrared light heats water just like everything else. The problem is that you are in the sophomore stage and denying the obvious, undermining all of us with your idiotic arguments based on half-understood physics. Ben, you are talking out of turn because you are so obviously uninformed on the matter, or misinformed. Heat lamps generate near infra red and adjacent sw radiation, which is not the far infrared that the discussion involves. The greenhouse effect involves far infrared, not heat lamp radiation. For example, the IR emittance of CO2 is at about 15 microns. This wavelength is absorbed in the upper 3 microns of water. To get on the same page, study the absorbency spectrum of water, which you obviously have have not yet done, and thank you for the compliment. Does IR heat the deep oceans? Isn’t it the air that gets warm, and not me? The problem with heating water with IR is it is all absorbed in the first millimeter or so, a skin effect. As it heats that skin, it evaporates. The evaporating water takes the IR energy into convection transfer vertically. A water column with substantial depth does not heat to any appreciable degree by IR. Vis and UV on the other hand penetrate to depth where the energy is retained, and the column warms. Rob G, it is not a question of whether water absorbs IR. Of course it does. It is a question of whether IR heats water. Of course it does _not_. Study the attenuation curve and you will be able to see that water is opaque to IR. In other words, all IR is absorbed at the surface, within a few microns. What happens is the incident energy, caught at the surface, translates into latent heat very quickly. Sure, but unless the evaporation happens very quickly or if water is not hot enough to evaporate, the millimeter layer of hot water will conduct the heat below. That is all what I am suggesting. But the notion that IR cannot heat water is wrong. IR is not, repeat not conducted below the surface. The upper “skin” is cooler than the underlying layer. See temperature profile of sea surface. Incident IR translates into latent heat in a matter of seconds. Conduction of heat is up to the surface from underneath. The IR is absorbed in less than 50 microns, mostly. A simple experiment with a bucket of water and a heat gun will demonstrate the principle that I have outlined: IR does not heat water. That uppermost ~3 μm layer is the interface layer and is less than 1% of the ~500μm ocean skin thickness, Donlon et al. (2001). The interface layer is always cooler than water just below it: http://disc.sci.gsfc.nasa.gov/oceans/science-focus/modis/MODIS_and_AIRS_SST_comp_fig2.jpg , again from Donlon et al., (2001) due to evaporation. Thus there can be no heat from 15μm IR transferred/conducted deeper into the ocean because the top ~3μm is cooler than the layers just below it. So if you try to heat water by using ghg-like IR be sure to use low temperature 15μm wavelength source no warmer than the atmosphere. Correct and thanks for improving on my points. Mpainter, RealOldOne2, and joelobryan, I think you are making simplifying assumptions here. It is a lot more complicated than that. The fundamental assumption you are making is when few micrometer thick water layer absorbs IR energy (any level of IR energy), it evaporates. But why? In an IR active material (or any radiation active material), IR/radiation heats (interacts) only the surface layer, the depth of that layer depends on the energy of the radiation and the absorption capacity of the material. High energy radiation with low absorption will penetrate deeper. Low energy high absorption does the opposite. The only difference here is that water being a fluid is capable of evaporating the hot layer, but that does not mean it has to evaporate using all the IR energy it absorbs even if the total energy it absorbed is not sufficient to overcome the interfacial energy for a phase transition. That is where I believe your assumption is an oversimplification. It might not get all the energy it needs to evaporate in an instant. If not there are several other mechanisms that takes over. Ocean water is never perfectly still (not to the micrometer level we are talking about), there are waves and molecules from the surface layer could go down easily. In short, whenever there is an IR radiation on the surface of the water, the surface layer doesn’t have to continuously evaporate. It might in some cases, but that is not a requirement. Also, energy is not the fundamental parameter that governs phase transition here, it is the Gibbs free energy, which takes into account entropy. Heat supplied, which increases enthalpy, is one aspect, of course. Vaporization involves increasing entropic contribution faster than the enthalpy to make the change in Gibbs free energy negative, but that increased entropy can also make the molecules to undergo diffusion jumps within the bulk water, rather than jumping out of the interface into vapor phase. These are not that straight forward or simple. RealOldOne2 , I am not sure how they measured temperature of ocean surface with micrometer spatial resolution, and under what conditions. Sea surface is not that perfectly calm at the micrometer level. But theoretically under some conditions it makes sense that temperature at the interface is lower than just below. If there is strong wind and evaporation occurs because of that, then the surface molecules can take energy from below. It all depends on the conditions. How the free energy is changed. Ooops… I should edit this before I post. Instead of this ” I am absolutely certain that if you heat that for three or four months.” what I wanted to say was: I am absolutely certain that if you radiate that for three or four months the water temperature will go up. Do you realize that your argument is with the tables and charts concerning the radiative characteristics of water? And those who have prepared them and used them this past century? I don’t know what to say except that I have encountered before people with your habit of thought who reject the facts of the matter. You are faced with the immutable laws of physics Rob, best to study and learn these instead of arguing against them. This all assumes that water is free to cool evaporatively. An experiment designed to restrict evaporation is faulty in this regard. No, mpainter, my arguments are against your interpretation of statistical mechanics in phase transitions. The “immutable” law you are using results from your assumption that any IR irradiated water should evaporate. That is simply false. Just like the other assumption you made in your last line. I did not restrict evaporation in the experiment, I contained the evaporated water from escaping in a large volume, just like earth. It is a closed thermodynamic system as far as matter is concerned. There is your main error, Rob, because the water does and will evaporate, each and every time, as demanded by it’s irremittant vapor pressure. Even ice has a slight vapor pressure and vapor pressure is a function of water temperature, hence the role of IR in promoting evaporation. And Rob, the discussion concerns the far infrared, that is to say the GHG IR flux of the atmosphere. Of most interest is the IR emittance of CO2 at about 15 microns, which is absorbed within the upper three microns of water. Do you now see? Radiation in the near infrared and also that above far infrared will heat water, but that is irrevelant to the issue. I understand all of that mpainter, and I agree with this line too “hence the role of IR in promoting evaporation”. I have no disagreements that IR enhances evaporation. Just to repeat again, that does not mean every IR activated water molecules must evaporate. There are no such rules. On the vapor pressure, I specifically restricted the container in the experiment to a closed container, to at least partially take care of the vapor pressure issues. I will just stop there, since we won’t be able to agree on this point. Let the truth prevail. Assume 1 cm/day evaporation (typical rate for lower latitudes). This averages out to about seven microns/min. Assume 3A° diameter for water molecule. This calculates to ~380 layers of molecules/sec. evaporating at the surface. Don’t you see? The CO2 generated IR is absorbed in the first 3 microns at the surface. It is not possible for the energy to reside in the water for more than a few seconds. The idea that anthropogenic CO2 adds to ocean heat content is utterly insupportable in view of the physics. statistical mechanics says otherwise, individual molecules do have a choice. That is why it is statistical. Thickness of absorption layer (which was repeatedly stated) does not change the kind of heat transfer, it changes only the degree. Regards and all the best. “And, not forgetting all of the depressing and shameful “demonization” of CO2 in these past decades, a review of botanic findings dating back to the Neolithic, 4000–6000 years ago, is enough to reveal that temperatures were higher on average than now by as much as 4°C and, where today there is the Ruitor glacier, conifers and lime trees once grew. In the end, when asking about the mysterious reasons why such a preposterous “theory” has lasted so long without a clear rejection by scientists and when trying to peer beyond the well-known political exploitation (“the worst scientific scandal of all ages,” as defined by Prof. Itoh of Tokyo Universityliv), it appears that the better and more honest answer has been given by the Israeli physicist Nir Shaviv, who candidly admitted a few years ago, “If I was asked about global warming a few years ago, I would have said, ‘It’s for CO2,’ Why? Simply because, like everyone, I listened to what the media were saying!” This work is dedicated to those who have the intellectual honesty of Nir Shaviv and have decided to reflect on a problem using their own minds, logic, and reason, no matter what the majority of the people are saying. I have to put the headline firmly in the “no sh*t” department. Just like warming over land isn’t global, it can’t possibly be over, or under, the ocean surface. It also accentuates why you can’t average an intensive property like temperature from different locations. It gives a grossly inaccurate view of reality. Just below the surface, Water is heated by volcanic activity in the various tectonic plate divisions. So it has zero to do with CO2. I seems to me that the Pacific and North Atlantic dump heat into the Indian Ocean and the South Atlantic. There was a story going around that the Argo floats actually showed a bit of ocean cooling. What happened to that? RoHa: see the post by Willis earlier today. Verney and Willis both have links to that. There was some discussion of the issue. Also a good crack about Medea by some wise guy. In a nutshell: NASA realized something “wasn’t quite right” when the ARGO data showed ocean cooling beginning in 2004. So rather than using the Scientific Method and questioning their theory, they instead questioned the “bad” data and Moshered it (adjusted it). Though vague in details, the adjustments seemed to be based around Sea Level Rise — on the premise that water expands as it warms. And Voila! The warming returned. I may be mistaken, but I’m pretty sure that the SLR data was already adjusted for various reasons. And lets face it, satellite measurements of a constantly changing sea levels is questionable at best. Thanks for that. I’m glad it has all been cleared up, and everything is now straightforward and above board. I like to be able to trust scientists. Absolutely. There is a lack of scientific rigour, and too much emphasis placed upon assumptions, especially given that those assumptions are in turn based upon questionable data. But in addition, there has been no attempt to assess whether the fundamental nature of ARGO (free floating buoys swept along on currents) leads to a bias (warming or cooling). Currents are density/temperature dependent. They have a temperature profile distinct to adjacent waters. It would therefore not be surprising that a free floating buoy which is carried on currents may yield data that is biased (one way or another – not wishing to pre-judge). This needs to be tested and ascertained, as well as realistic error bands brought about by lack of spatial coverage. Reminded about the Indian Ocean Dipole, Australia seems to be in the ‘negative phase’ with a cooler West Indian Ocean, bringing fantastic rain to the Northern Tropics and South East. The opposite of El Nino. less rainfall over southern Australia and the Top End. more rainfall in the Top End and southern Australia. Has anyone done a comparison between the ocean basins that are warming and the CO2 anomalies found by the satellite mission? From memory there was a large CO2 build up on the East coast of North America, in the Pacific, East of New Zealand and in the Indian Ocean, West of Australia. Does that correlate with any of the ocean warming data? So, you’re saying that the treatment of the Medieval Warming Period as being regional has all been projection. Evidence for the Medieval Warming Period has been found in all regions of all the continents from Australia through Antarctica and South America across Europe and over through Eastern Asia. The only question of significance is the role of CO2/GHGs and the GHE. Does it or doesn’t it? All the rest is academic gum flapping. Thank you for the link. I started reading it and I had to finish reading it. Now I will have to go back to it and understand it better. It is very well written. I also find the http://www.co2science.org site noted above to be extremely well done as far as presenting the beneficial effects of CO2 being our only gaseous fertilizer. I’d say an equally valid statement could be “Global warming is not actually Global warming at all”. The inconsistency between the US trend and presumed global warming over the past century or so is demonstrative of regional climate variation. More so than the contrived assertion that the MWP was regional. If I showed this Fig 1 graph to my CAGW friends they would say “see the temperatures are rising out of control”. +0.067 Deg C/Decade?? NOTE: I really appreciate all your work that goes into your posts, it’s just that the small increases in temps seem exaggerated on all the graphs used (not just the ones you use). Interesting. What about the Southern or Antarctic ocean? AntonyIndia, very little warming south from 70S to 55S since 2005. South of 70S, there has supposedly been cooling, but the data at those latitudes have to be looked at with a grain of salt due to seasonal sea ice. Correct, but a very poor analogy. Your skin surface gets warm, hot if you are close enough to the radiator. The sub-dermis warms by conduction. Your blood is warmed by contact with the sub-dermal layers and transfers the heat to the rest of the body. That is how you get warm. Try your swimming pool. Surface gets hot, the depths stay reasonably cool. I suggest that the top layer down to perhaps 6″ gets warm because of turbulence due to wind, and from Brownian motions (though I doubt the efficacy of this in transferring heat down fast). The bottom of the swimming pool gradually warms because of the filter taking water from the bottom, or the topmost surface layer, or both depending on how you have set the filtration system, and injecting it at high pressure into the pool, keeping deeper turbulence in the pool, and resulting in gradual mixing. You can check temperatures at a specific time, say 2 pm, for the various layers – top inch, 6″ down, 3′ down and 6′ down. Then try on an equally sunny and windy day, with the filtration system not operating. I would suggest you will get the topmost layers far warmer and the bottom layers colder, as the only mixing will be due to wind. 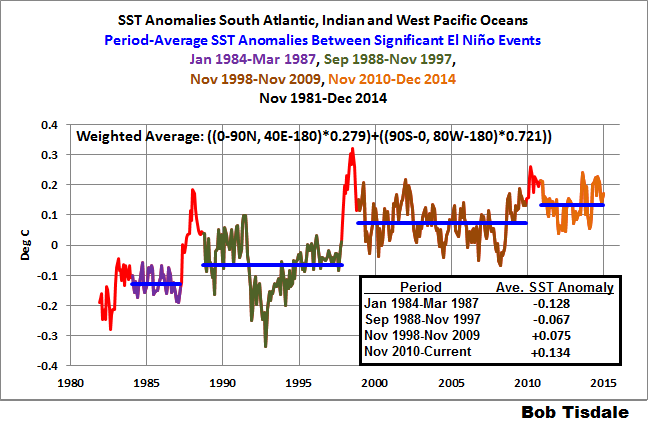 When & where NOAA finds it useful they say it was an El Nino year. Wrong story link with NOAA quote. The ‘North Atlantic’ is ‘1/50th of one degree centigrade’ warmer than it was twelve years ago. If you say it as 20 milli-degrees, it might sound better. And that well over 1,666 micro-degrees per year. Okay, okay. But the sign is positive…it’s warming. Why is it difficult to imagine? Each ocean has different rates of down welling and upwelling, as well as turbulence. The differences down deep have more to do with circulation than warming from greenhouse gases, with the provo that greenhouse gases effect the warming at the surface and that eventually gets deep. Pippen, see my comments above. CO2 has no effect on ocean heat. Yeah I saw that. It’s just your arguments are not very logical so I didn’t really pay much attention to them. But hey you’re doing the best with what you have so I have to give you credit for that. Why do you persist in trolling by providing such content-free posts from behind the coward’s screen of a pseudonym? Whether or not mpainter has good “arguments”, his “arguments” are sufficient for them to have defeated you. Your response to mpainter is an unjustified assertion of “not very logical” which – of course – admits that mpainter has made logical arguments. Importantly, you have provided nothing to dispute what mpainter has presented but say you “didn’t really pay much attention to” what he has presented, and I give you contempt for that. Please take your offensive trolling elsewhere. It wastes space on threads. +1, mpainter. always appreciate your precise clarings. consumes nerves, in the longrun. No impact to the real world? MINISTRY Andrea Nahlen, chanting ‘pippi langstrumpf’ when joining Merkels new coalition. You haven’t seen it, You can’t believe it. Quite a girl, that pippi. CO2 miracle gas, part of the atmosphere yet does not heat the atmosphere…transmits captured heat directly to ocean…hmnnnn. “Why is it difficult to imagine? Each ocean has different rates of down welling and upwelling, as well as turbulence” Then it shouls be evident in at least the uppper 2000m. Or, the heat should be detected in transit from the surface to depth. Bothers would-be scientist’s not a whit that this heat is undetected. Your reply does not account for the absence of warming to depths of 2000m in the ocean basins that cover 66% of ocean surfaces. Nice try, though. Pippen Kool, PS: Are you saying that natural variability (“different rates of down welling and upwelling, as well as turbulence”) are capable of suppressing ocean warming to depths of 2000 meters? There would be an “absence of warming” in those oceans that have not seen as much mixing as others. We are talking thermodynamics of a fluid/gas interface here, and given that the oceans heat the atmosphere (overwhelmingly), and not the other way about then heat transfers upward into the atmosphere for the most part. The oceans that exhibit least downwelling heat flux are just those that (currently) are most efficient at that process. Indeed so – as the heat capacity of the oceans is ~4000x that of the atmosphere. ie 1000x the mass and a SH of 4x that of air. So FI a rise of 0.001C in said oceans equates to a rise of 4C in the atmosphere. Bob thanks for another “just the facts” post. Has anyone else noticed that it is the peak of summer in Australia, and last year, or was it the year before, we were inundated with stories about the hot hot Australian summer, in January . Well apparently they are not having a hot summer down under as I have not read one story about it in the MSM in January 2015. Average and cool summers are apparently not noteworthy. The same strange definition of global from Tisdale. If it is not the same amount of warming everywhere then ti is not global. A mean value for the globe is not global according to Tisdale. rooter, to root something in OZ means to eff it up, your brain does seem to be rooted. Thanks for misrepresenting what was presented and discussed in the post, rooter. rooter does that a lot. A mean value for the globe is meaningless, no pun intended. Is there any temperature series anywhere that after ‘adjustment’ to the data by climate ‘scientists’ does not show a ‘warming’ or enhanced ‘warming’ trend? Have Tisdale ever presented global temperature series? Were those series mean values of the global values? Did Tisdale use those series to proclaim that it was Ninjos that was the cause of warming? Whatever changed along the way? You are confusing apples with pears. Plotting El Nino(s) against global temperature series allows for relationships between them and any temperature changes to be seen. Whether or not the temperature series has been adjusted to increase recent or to lower historic temperatures is irrelevant to the existence of any such relationship. Adjustments would only impact on calculations of the effect of such a relationship – not its existence – that is unless they have been made with the intent of disguising any el nino or nina effect. Has that happened ? I have no idea, but one thing for sure is that all the ‘adjustments’ to recorded temperatures made by climate scientists have resulted in recent temperaures artificially appearing elevated compared to historic ones – something noted by Tisdale about the difference between the raw argo data and the adjusted and then published data. So there is something called global warming then. Even though not all areas do warm at the same rate. That is. Sometime. It does not apply when the heat accumulation is so obvious that it cannot be denied. And does not have the same ups and downs as enso. rooter, once again you illustrate for everyone that you have to rely on misrepresentation and fabrication in your arguments. That leaves the North Atlantic which is also impacted by another mode of natural variability called the AMO, which caused the surface of the North Atlantic to warm at a higher rate as part of its cyclical nature. rooter, as I’ve suggested before, you really should shift your blogging efforts by commenting at HotWhopper. There, they are more than happy to misrepresent my work. You’d fit right in. Here you look foolish. 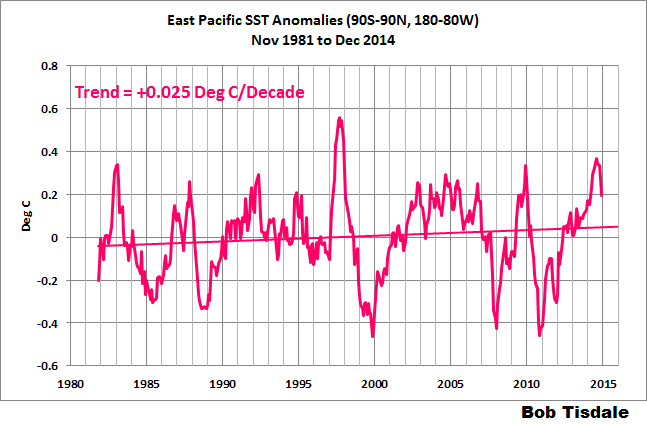 Ninjo causes warming because there is very little warming in Equatorial East Pacific? Ninjo causes warming because ocean temperature varies with Enso? At last someone found that ocean temperature is strongly affected by Enso. The upward shifts would not happen with no warming trend. With no warming there would be as saw instead of at stair. I will from now on boil my potatoes by heating the air above the pan. fritz, the Pacific Ocean, with little to no warming to depths of 2000 meters, spans both hemispheres. So there is warming then. Much energy needed to accomplish that warming. And for some reason unknown to Tisdale much energy is needed to warm the biggest ocean basin. Some day Tisdale may even discover ocean currents. IIRC, when the Soon and Baliunas paper came out showing that the last century wasn’t the hottest of the last 1,000 years no matter which proxy record or dataset was used, one of the major criticisms was that even though essentially all proxy records had a past temperature greater than now they were not all “contemporaneous” with each other. They insisted that because these warmer temperatures of the past were not contemporaneous across the entire globe at one time that they were seeing regional effects within each proxy. So, if the current warming is NOT “contemporaneous across the globe” does the same criticism apply now? The global mantra is a political conscript. It is the only way that politicians can argue that we are all in it together, the world has to act as a whole etc. The reality is something rather different. There is (on the timescales we are talking about) no such thing as global warming; some parts of the globe are warming, some parts are cooling, and some parts are neutral. Likewise, climate. Climate is a regional not a global phenomena (unless one is talking about ice ages/inter glacials). Further, some areas (countries) will respond favourably to a warming world, some will be neutral, and for some, it may be a negative. Likewise sea level rise will impact differently on different countries. Heck some do not even have a coastline (eg. Switzerland), and some have rocky cliffs rising high out of the sea (such as Norway). It is unscientific to talk about global warming and global climate change. This illustrates why climate science is not a real science, or at any rate it demonstrates that the majority that practice in this area do not apply the highest standards of scientific rigour to their work. .
One of the major problems in this area of ‘science’ is the almost universal practice of using averages. This masks what is really going on, and unless one knows what is really going on, one cannot begin to understand the reason why changes are taking place. How long does it take for a photon (or its exchanged cousin) emitted from the planetary surface to make its way up to TOA and from there to be radiated out to space when CO2 concentration is say 280ppm, and how long does it take a photon (or its exchanged cousin) emitted from the planetary surface to make its way up to TOA and from there to be radiated out to space when CO2 concentration is say 400ppm? If one cannot answer that question, one cannot even begin to seriously discuss whether rising levels of CO2 are causing planetary warming. Interesting discussion above by several people about the plausibility of downward IR warming the ocean down to layers beneath the surface absorption layer . Consider a flat , windless ocean on which IR , of a spectral distribution that is absorbed to 99% in d microns , and of intensity W watts/m^2. Heat is lost through evaporation from that layer , and also by conduction away from the layer , by a saline fluid of conductivity k , W/m.K and thermal diffusivity ( the most important factor perhaps) , t , m^2/sec. Questions : 1: how does the temperature of the surface layer change with time after the IR irradiation starts? 2: what is the equilibrium temperature? 3. ( to sort out the really clever ones ) what is the effect of a wind across the surface , with a relative humidity of RH and a velocity of v m/sec? The only prize for solving this is personal satisfaction. Mike, the temperature profile of the sea shows that in daytime heat is conducted to the surface from beneath, not downward from the surface. The daytime upward conduction is presumably from warming created through a (500?) m water column by absorption of visible and NIR out to 4um wavelength . But there must be a net contribution from the LWIR down from the CO2 emission ,effectively at night perhaps , otherwise there is no greenhouse effect on the SST , contrary to the opinions of 97% of scientists far more knowledgeable than I. And if 71% of the Earth’s surface is water , then the major greenhouse effect must be on land. But land surface temperatures do not necessarily substantiate that conclusion do they ? I am totally confused , and embarrassed now. I suggest a little research. Get the radiative absorbance of water and also the temperature profile of the sea surface. Study these and you will see for yourself that IR, GHE, CO2, have no effect on SST. Guess what happens when skin is warmed. What happens to to the transport of heat through the skin from below? Mpainter and rooster , a belated reply : I think that it comes down to kinetics . We all are aware of how IR laser ablation can be used to correct defective vision or remove tattoos by focusing short pulses of high power , highly absorbed IR onto tissue. The surface then is boiled off , or vaporised without roasting the underlying tissue because the dwell time of the pulse is very small compared to the conduction times given by the low thermal diffusivity of tissue ( which is largely water) . The energy absorbed on a short time scale is transferred into the kinetic energy of the vaporised atoms of the surface layers and not conducted down. In the theoretical flat windless ocean the same principle exists , but the IR pulse is infinitely long , so eventually there would be conduction to the layers below , but I recognise that there may be upwards conduction that masks it . ( You could incorporate the direction of heat flow into the continuity equation) This theoretical model has no real bearing on the actual ocean situation , but I thought that it was an interesting theoretical problem that might resolve some of the differences of opinion expressed much earlier about what happens when IR meets a water surface ( or a cold ice sheet). I bet there are old , dusty copies of J. Ind Engineering from the 60/70s in which the equations for IR ablation have been thoroughly discussed..
1. DLWIR is caught on the surface of water; for example, CO2 emits at about 15 microns and this wavelength is absorbed within 3 microns. 2. The temperature profile shows that the heat moves toward the cooler surface from beneath, which is warmer. The whole time the surface evaporates and IR is converted to latent heat very quickly, as per my illustration for Rob G above. What’s the accuracy of the thermometers used in ARGO? I understand glass thermometers have measurement accuracy of +/- 0.01 C. Temperature change of 0.006 C per year seems to be within the measurement error range and insignificant. Evaporation carries about 1,000 Btu/lb, driven by how dry the air is not how hot. Sensible heat by conduction: 1 Btu/lb F for water, 0.24 Btu/lb F for air. Air/CO2 just doesn’t have the cojones to make a difference. 0.01 C? I doubt that. ARGO won’t be reading glass thermometers, more likely thermistors, RTDs, T/Cs. +/- 0.01 C would be what, 0.01 C/55 C = .019%. Where are you going to find an instrument with that resolution/accuracy? A lot of digital temperature ICs have between 9 & 12 bits of resolution, accuracy is a different animal. I built a system in the 90’s that monitored each battery module voltage and temperature, across a full EV pack. It was automotive, so it had to be cost effective (cheap). The temp sensor I chose had 0.0625 C resolution, +/- 0.5C accuracy. (akin to Dallas DS18B20). To meet the design & cost spec, I had to calibrate the array of modules for voltage & temperature, and save cal constants on-board. I could detect a hand held above the sensor from several inches away. required to induce that evaporation. oceans to air continues undisturbed. The ARGO temperature increases seem to correlate to the OCO-2 averaged carbon dioxide concentration. Before the early 2000s, even the IPCC calls into question the usefulness of the sparse temperature measurements of the deep ocean. Then why does the IPCC AR5 WGI Ch3 on oceans have the following graph showing the rise in heat content from 1970? Maybe a bit of inconsistency here? 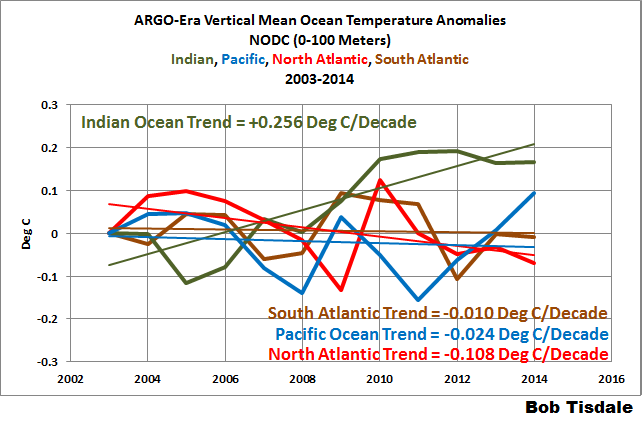 I don’t see any trend in those ocean basin ARGO temperature data, except for the Indian Ocean in 2008 and 2009. 2008 was a moderately weak Monsoon, and 2009 the 3rd weakest monsoon since 1901. Demonstrating horizontal water vapour transport from oceans to land regulates the Indian Ocean water temperatures. Probably true for all oceans. Just more pronounced variation for the Indian Ocean. And probably a/the major regulator of the entire climate system. One cannot begin to meaningfully discuss the reasons for ocean warming without knowing full details of clouds. This is very complex since it is not simply the area of clouds, but also the height at which they form, the volume, the composition of the clouds, the time of the day they form, the time of the day they disperse, the season and the latitude. All of this has an impact on how much solar reaches the oceans and the grazing angle of solar reaching the oceans. 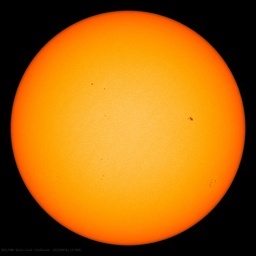 I am of the view that to the extent that there has been any real warming of the oceans, then the probable explanation lies in changes in the amount of solar insolation reaching the oceans. It is possible, to some limited extent, that some deep ocean warming may be explained in some areas by local changes in plate tectonic/subduction zones (energy/heat being released in the shifting) and volcanoes. The equatorial and tropical oceans are the heat pump of the planet. Energy absorbed in these oceans is circulated across the globe. That makes it difficult to look at each ocean basin independently, since some ocean basins are (to some extent) reaping the rewards of energy inputted in a different ocean basin. So one has to be circumspect in drawing definitive conclusions from different patterns observed in each ocean basin. That said, Bob has shown that the ocean basins are warming quite differently. This is not likely to be the case if warming was the result of increased CO2 (whether naturally occurring or due to manmade emissions) and if CO2 is a well mixed gas (which it may not be as well mixed as some assume). The trends in these circumstances should be similar, at any rate in broad terms, across all basins, but it is not. DWLWIR and the oceans is a problem since no one has offered a sensible physical explanation as to how DWLWIR absorbed in the top 2 or 3 microns of the oceans can result in heat/energy be dispersed and dissipated downwards at a speed greater than the speed that energy absorbed in the top 2 or 3 microns would otherwise power evaporation from the very top of the ocean. I have seen some suggest that an IR heater can heat water, but first the wavelength of a typical IR heater is different, second, the temperature of a typical IR heater is very different (and we are dealing with T to the power of 4 so differences in temperature are extremely significant). Konrad has done some experiments demonstrating that when water is free to evaporate, LWIR does not heat the water; it merely powers evaporation. Climate scientists need to conduct some real experiments to obtain some real data on the extent to which DWLWIR heats the oceans, the amount of energy absorbed on a micron by micron basis for the top few centimetres and the rate at which energy absorbed in the top 2 or 3 microns is dissipated downwards to depth and via what mechanism. When this edifice falls down (as it almost certainly will as mother nature continues to show that the assumptions made by cAGW proponents were wrong), climate scientist will no doubt revisit the role played by the oceans, and will appreciate the problems with DWLWIR and the oceans, and that it does not effectively warm the oceans. I will be sorry to see this thread expire since it is getting so interesting , but the subject will recur no doubt (everything to do with climate is cyclical it seems ). Your comments on clouds led me to read what Salby says in Ch 9 of his book , talking about cloud forcing . I know that I should not “cherry pick” comments but , after a rigorous mathematical discussion of the effects of SW and LW heating and cooling effects in clouds and their effect on the climate near the ground he states that , under certain conditions , global mean cloud forcing could be a negative effect , -15W/m^2 , representing cooling about three times as great as the warming introduced by a doubling of CO2. IPCC AR5 TS6 admits poor understanding of clouds. Rehashing the same lie that got debunked a few years back, Tisdale? Climate is the continuation of oceans by other means. Not only the climate influences the ocean, but the ocean influences the climate. So, when climate is heating, it means that the ocean is already heated and that there is something happening on the ocean. What else could it be? Naval activity, warfare, etc. It is obvious that we should pay attention to the ocean to see whay global warming is happening. You can read on http://www.1ocean-1climate.com about the way the factors that affected the ocean caused the most dramatic climate changes in the past 150 years. What does one mean by “global warming”? It seems to me that one does not mean anything!